County Armagh is often referred to as the “Orchard County” on account of its many orchards. The name “Armagh” derives from the Irish word “Ard” meaning “height” and “Macha”, together meaning “high place” after the goddess Macha, and up until the 4th century AD it was the effective capital for the kingdom of Ulster, named “Emhain Mhacha”, situated today just outside the town of Armagh. Ancient Armagh was the territory of the Ulaid before the 4th century AD and was ruled by the Red Branch, whose capital was Emain Macha. The site, and subsequently the city, were named after the goddess Macha. The Red Branch play an important role in the history of Ulster. The most famous being the cattle-raiding exploits of the kingdom and its conflict with the kingdom of Connacht under Queen Maeve which are recorded in the epic Táin Bó Cuailinge, the Cattle-raid of Cooley, which also tells of a young Cú Chulainn defending Ulster. The significance of the area is the main reason why St Patrick chose to establish it as the center of his church to spread Christianity throughout Ireland in the 5th century. Most notably, Brian Boru, probably one of the most famous High Kings of Ireland, is believed to buried in the graveyard of St Patrick’s Church, and to this day, Armagh is still the ecclesiastical capital of both the Roman Catholic church and the Church of Ireland. However, the Red Branch were eventually driven out of the area by the Three Collas, who invaded in the 4th century and held power until the 12th century. The Clan Colla ruled the area known as Airghialla or Oriel for the next 800 years. During this time Armagh experienced its fair share of Viking and Norman raiders through the centuries, plundering it of its many religious artifacts and historical valuables, including the Book of Armagh, a 9th Century manuscript which is now held on show by the library of Trinity College Dublin. Armagh was again further colonized by English and Scots settlers at the start of the seventeenth century as part of the Plantation of Ulster under King James I in efforts to make the Irish less rebellious to English rule, leaving only the rugged and less fertile land south of the county in the hands of the native Irish. The strong nationalist traditions of south Armagh have become well known more recently, most notably in the Troubles of Northern Ireland from 1969 – 1997 where the southern part of the County has been a stronghold of support for the IRA, earning it the nickname “Bandit Country”. Armagh is the spiritual capital of Ireland for over 1,500 years, and has the seats of both the Catholic and Protestant archbishops. Saint Patrick built a stone church on the hill where the Anglican cathedral stands. Brian Boru, who drove the Norse out of Ireland at the Battle of Clontarf in 1014, is buried in the graveyard. The Cathedral library has a copy of Gulliver’s Travels corrected in Dean Swift’s own hand. Navan Fort is two miles west of the city, was once the stronghold of the Kings of Ulster. There are rich fruit orchards to the north east of the city, and this is where the county gets its name as the Orchard of Ireland. The quaint town of Bessbrook is a very early Quaker settlement and model village. It was built around the linen industry in 1845 by the Richardson family to house their workers. The layout remains as it was in that time with the local granite stone – of which it is made, and the original streets, terraces and squares. Bessbrook can also boast the Craigmore Viaduct, an 18 arch viaduct sweeping across the valley of the Camlough River, as well as the National Trust’s Derrymore House – an elegant 18th century thatched cottage built as a country retreat. It was here in the Derrymore House that the Act of Union was drawn up. St Patrick made Armagh the centre of his mission in Ireland in the fifth century. Craigavon is very thoroughly signposted from the M1. Turn off at junction 11 for a look at the province’s first ‘New Town’, designated in 1965, and named after James Craig, Lord Craigavon (1871-1941), first prime minister of Northern Ireland. Crossmaglen is a little hamlet burrowed in the bottom corner of South Armagh and is the ideal place for anyone who wants to have a bit of craic. Crossmaglen is famous for its traditional music sessions in many of the local pubs. If you wish to flavour ‘Old Ireland’, come along to the towns’ fair day, or take part in a quiet spot of fishing. You can also enjoy watersports at Lough Ross. The village of Cullyhanna nestles neatly among the hills in the southwest corner of south Armagh, located on the main road between Newtownhamilton and Crossmaglen. The recently opened Ashfield Golf Course, an 18-hole course, allows one to relax and unwind. Cullyhanna offers its visitors the chance to explore the religious, cultural, historical, social and archaeological interests of the area. It is home to the Cardinal O’Fiaich Heritage Centre, which commemorates the life of Thomas O’Fiaich as well asbringing awareness to the heritage of the area. Not far from here lies Creggan Parish Church with its beautifully kept poets graveyard and headstones, dating back to 1685. Located on the border with County Louth, this hamlet is in the vicinity of Moyne Castle. Slieve Gullion is just to the north. Jonesboro is the closest village to the border with the Republic of Ireland and has one of Ulster’s most lively open markets, attracting large crowds to their Sunday Fair. Not far from the village lies the ruins of Moyry Castle built in the 17th centuryto guard the Gap of the North. The Kilsnasagart stone is close by and is thought to be one of Ireland’s oldest Christian monuments. 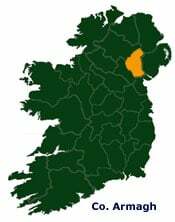 Keady, lying to the south of Armagh City, is the largest of the local towns with an estimated population of over 3,000. The town was also to become a centre of tailoring before the first World War, and the advent of the railway brought the town great commercial benefit, although the lines for both goods and passenger traffic have since closed. Today, Keady retains its links with clothing manufacture, with a major textiles firm affording employment for many of the local people. Situated on the river which flows from Clay Lake to the River Callan, Keady is noted chiefly for the ‘Keady trout Lakes’. It is also of interest to the industrial archaeologist as the centre of a district with many derelict watermills. Tassagh Glen, just outside the town has mill and viaduct of monumental proportions. The newly restored mill in the centre of town offers the visitor a unique glimpse into Keady’s fine industrial heritage. Lying 6 miles west of Armagh City, the residential village of Killylea originally formed part of an endowment of land to Trinity College, Dublin. In 1610 the Rev. Robert Maxwell arrived from Scotland to become Dean of Armagh, and for three hundred years his family was associated with the area. The handsome parish church, dedicated to St. Mark in 1832 makes a pleasant feature at the head of the village. Loughgall is surrounded by 5,000 acres of apple orchards, prettiest at blossom time (May/June). Loughgall Manor, at the end of an avenue of mature lime tree, is a picturesque gabled mansion with a lake. Work on the estate includes livestock husbandry and plant breeding as well as fruit and vegetable research. An ancient yew walk near the manor house was planted over 300 years ago by the Cope family who settled here in 1610. The Orange Order was founded by Pretestant farmers in 1795 at Sloane’s Bar in Loughgall after a fight between Peep O’ Day boys (Protestant) and Defenders (Catholic) at the Diamond, outside the village. An unprententious town with an agreeable broad main street, Lurgan was granted to the Brownlows of Nottingham (later Lords Lurgan) after 1607. Textile firms and clothing manufacturers are still important here. Distinguished Lurganites include James Logan (1674-1751), scholar and scientist. He also helped found Pennsylvania. Markethill is itself a flourishing country town, with recently established light industries and a busy cattle market. G.H. Bassett, writing in 1888 noted that Markethill had been injured by the concentration of market interests in the larger towns, with Armagh and Portadown drawing away the cream of the produce. However, the town has since overcome this decline, and is one of the District’s more flourishing and attractive centres. The village with its wide main street and buildings festooned with flowers for much of the year, is a record breaking winner of the “Britain in Bloom” awards. Every shop, house, courtyard and archway of this lovely little country town has its own baskets and boxes of brilliant colour. There are also notable examples of Georgian architecture including the former town hall and the elegant St John’s Parish Church. The town, although having grown in size over recent years, retains a feeling of intimacy and completeness and the main street is well served by numerous excellent restaurants, pubs and coffee shops. Moira Station is Ireland’s oldest working station house; it’s a good starting point for walking the Lagan Canal towpath to Soldierstown and Aghale. Mullaghbawn is a small community situated in a valley surrounded by the Slieve Guillion Mountains. The outdoor centre close by provides horses for leisurely rides throughout the countryside. If a more relaxing interest is required, you can always go along to the local museum or to the Ti Chulainn Heritage Centre and learn more about the local cultures and traditions. A trip to the Ballykeel dolmen is a must when visiting this area or the home of Art Bennett, a Gaelic poet and scholar is close by. The building of the canal from Newry to Lough Neagh in the 1730s brought prosperity to Portadown. This busy textile and manufacturing town developed with the linen industry. Today it has factories making carpets, industrial ceramics and jam. The wide sloping main street has a triangular ‘square’ at either end. More than a dozen denominations have buily churches and chapels in one small central area. Sir Robert Hart (1835-1911), who created the Chinese Post Office and founded their lighthouse service, was born in Woodhouse Street. The largest of Armagh District’s villages, Richhill acquired its name for the Richardson family whose castle stands at the top of the main street. The settlement was formerly known as Legacorry and was considered to be one of the finest properties in the country at the time of the Plantation of Ulster. Now principally a dormitory centre, the village nucleus still retains a certain elegance with its hill top square, church and castle and its broad street descending to the war memorial. The main street at Tandragee on the Cusher river, curves up the steep hill to a baronial style castle built in about 1837 by the sixth Duke of Manchester. In the 1950’s it became a potato crisp factory. A tour of the factory provides an opportunity to see the inner courtyards and to learn something about the potato, Ireland’s staple food from the mid seventeeth century.